APHA and the five regional delivery companies say large numbers of vets have signed up and they expect the new system to run smoothly. But more time has been given to vets in Devon and Cornwall to sign up. The new TB testing regime in England started on Friday (May 1), with good veterinary coverage in place across most regions, with the exception of Devon and Cornwall. Due to low take up in Devon and Cornwall, the deadline for vets to sign contracts there has been extended to May 14. However, the Animal and Plant Health Agency (APHA) moved to reassure the veterinary industry over the implementation of the controversial regime by insisting take up generally was good across four out of five of the English region. Across England as a whole, almost 200 practices have already signed subcontracts, with others expected do so ‘very soon’, according to a letter from APHA to the British Veterinary Association. APHA and the XL Farmcare companies, which were awarded the English TB testing contracts in February, both insisted they were confident the system would run smoothly from the start. They claimed vets had not been given sufficient time to consider crucial new contracts. The Delivery Partners issued contracts to potential veterinary practice subcontractors earlier this month with a deadline to sign contracts of April 24, a week before the planned start date. In a letter Defra Secretary Liz Truss, the two veterinary organisations had asked her to delay the contract deadline by a month and commence the new regime on June 1. BVA President, John Blackwell said members of the across the country, including in the high incidence TB areas in the South West, had raised a number of questions about the contracts and ‘needed more time to properly scrutinise the detail’. “We have consistently warned Defra that the move to tendering must not simply be a cost cutting exercise, because the UK’s network of veterinary practices, which is vital for spotting and dealing with animal disease, is at stake,” he said. The veterinary organisations and the NFU have been warning for weeks that a number of veterinary practices have not signed up to the new regime, deciding the lower fees for test and cost of registrations means it is not financially viable to do so. The fear was this would leave some farmers unable to use their local vet for Government-funded TB testing. But, after receiving reassurances from APHA veterinary director Simon Hall that large numbers of practices had signed up, Mr Blackwell said this ‘demonstrates that the veterinary profession has prioritised delivery of TB testing for the public good, and will ensure that the fight against TB will continue without delay’. We asked APHA and the Delivery Partners to address some of these concerns and explain how the system will work in England. What do farmers need to do to arrange tests from May 1? Work allocated by APHA to veterinary practices prior to May 1 in England (and April 1 in Wales where the change came in a month earlier) will remain with those practices, beyond May 1. From May 1 in England TB Test Notification Letters will advise farmers which Delivery Partner they should contact to arrange testing. Farmers can also use APHA’s online post-code finder to establish which Delivery Partner covers their area. The Delivery Partner will then be responsible for allocating testing work, which will continue to be undertaken exclusively by qualified vets. Have enough veterinary practices signed up? In order to provide sufficient coverage, the Delivery Partners need to sub-contract local veterinary practices. In a letter to the British Veterinary Association, APHA veterinary director Simon Hall said ‘large numbers of practices have already signed subcontracts in four of the five regions’. An APHA spokesperson said: “The new approach to veterinary services delivery in England will be introduced gradually over the coming months”. He said the ‘extremely high level of registration’ for OV training and authorisation suggested that farmers should have no difficulty in accessing a suitable vet’. He said APHA expected the majority of vets and practices would continue to provide government testing services within the new contracts and that the Delivery Partners would be ‘ready for the commencement of the contract’. But he acknowledged some OVs and OV practices may make the business decision to no longer offer TB testing or other services and differences in take-up across the English regions. The XL Farmcare regional companies did not reveal numbers but said in a collective statement they were ‘delighted that many veterinary practices have signed up to deliver TB testing services’, with numbers increasing on a daily basis. “With such a good response the XL Farmcare regional companies would like to reassure farmers that when the contracts commence on 1st May that their TB testing will be carried out efficiently and effectively, and in most situations will continue to be delivered by their own vet,” a spokeswoman said. Will I be able to use my local vet? Delivery Partners will contact farmers regarding the veterinary practice they would prefer to use. If the farmer’s preferred practice is contracted to work for their regional Delivery Partner they can continue to use them for Government-funded testing. If the preferred practice is not contracted and the farmer wishes their TB testing to be Government-funded, they will need to select a practice from the Delivery Partner’s list of contracted practices. Delivery Partners are obliged to provide a TB testing service for these so-called ‘orphan farms’ and are recruiting additional practices to cover them. In circumstances where Delivery Partners cannot recruit additional practices, they will use their own vets to deliver the services, APHA said. 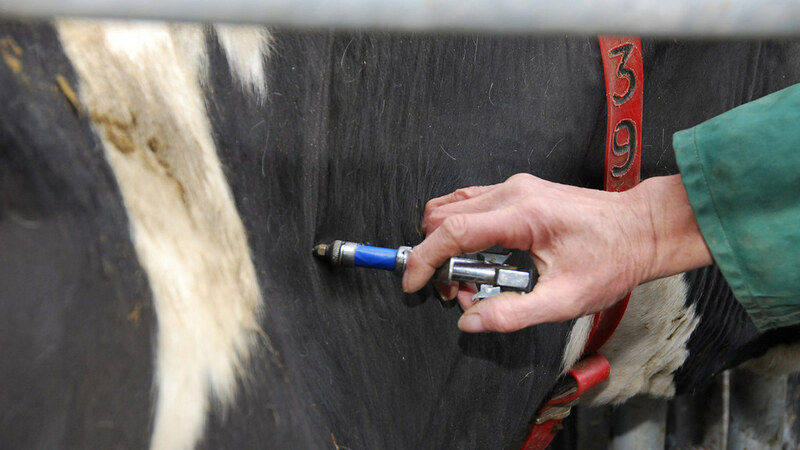 Farmers retain the right to pay privately for their TB tests to be undertaken by a preferred practice outside the Delivery Partner’s list of practices. Farmers would need to inform APHA of their intention to pay privately. What flexibility is there is in the timetable for vets to sign their contracts? APHA told the BVA and Farmers Guardian different things on this issue. The deadline for vets in Devon and Cornwall has been extended to May 14, from April, as take up there has been lower. But despite complaints from vets about the short time given to sign contracts earlier this week, APHA told Farmers Guardian there was currently no deadline from Delivery partners for vets or veterinary practices to sign sub-contractor contracts. “However, they are being advised that it is better to sign up earlier rather than later, if they wish to avoid the possibility of other vets undertaking Government-funded TB testing at their clients’ farms,” the agency said. The spokeswoman for the Delivery Partners said they were working to the timetable laid out by APHA as far as contracts are concerned. What assurances can be given that farmers will not face cross compliance fines if TB tests are late due to a shortage of available vets? By introducing well-structured contracts with clear terms and conditions the obligation is on the regional Delivery Partners to assure the quality and timeliness of services delivered, APHA said. It said there was no reason for farmers to be concerned about TB tests being delayed by a lack of available vets. Where can farmers and vets get more information? There is more information for farmers, including links to a detailed briefing and to Delivery Partners’ websites on the APHA website. There is more information for vets and veterinary practices on the APHA Vet Gateway website.